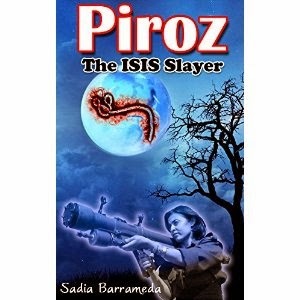 Sadia Barrameda's “Piroz the ISIS Slayer” is the story of one brave teenager's fight against ISIS. The main character, Ren, is a determined, kickass young lady who seeks to avenge the family members who died at the hands of ISIS. Unfortunately, ISIS is growing stronger and has stolen Ebola samples and plans to use them as weaponry. Partnering with Colonel Mark Thomas, Ren battles ISIS in a variety of locations in this story filled with action and adventure. My favorite thing about the book is the main character. The author writes a character that is fun to read about, and her determination is completely inspiring. I also liked the many action scenes throughout the book. The plot is fast-paced and it only took me a few nights of reading to get through the book. Recommended if you want a fun, action-packed book about a real-world threat (ISIS).